Now that the kids are a little older, we’re back to a pastime we loved long before the babies arrived- going to the movies. It’s always been an expensive hobby- once you factor in tickets and concessions, you’re looking at a decent $40 price tag. But now that we’ve got double the people in tow? We’re looking for creative ways to save money at the movies wherever we can find them. Once we were sure that Abram could sit through a movie (we tested it out with those cheap summer movies we love so much), we decided to take the kids to a proper, new release. $80 later (I’m not exaggerating!) we had been entertained for a couple of hours, and had a lot less money to show for it. It took us a couple of years (and a LOT of wasted money) to come up with these money saving movie hacks, but once you’ve got them down, you’ll find that you get a lot more bang for your buck at the theater. 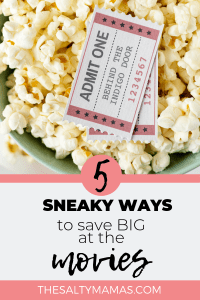 So pop a little popcorn now, sit back, and enjoy this list of creative ways to save money at the movies. What’s the Best Day to Go to the Movies? 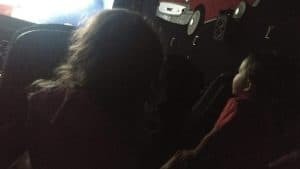 First and foremost, you need to know a little movie theater secret- many different theater brands have days with reduced price tickets. The days (and prices) will vary widely by location, but after you’ve done your preliminary research, you’ll find that it’s easy to plan your movie outings around the “cheap” movie schedules. For example, in our area, three different theaters offer cheap tickets. AMC features $5 Tuesdays, while rival Pacific Theaters offers tickets for as low as $6.50 on the same day. Our personal favorite is the biggest theater in town, Edwards, which has tickets for just $7 every Sunday. It’s a bit steeper than the other “cheap” tickets, but given that we can attend on a weekend makes it worth the extra money so that we can attend the movies as a family. I didn’t realize there was so much variation between the theaters, but this is a great way to find out how to save money on movie tickets. Knowing the age limits for kids to attend movies for free can make a huge difference in your ticket total. Pacific Theaters requires tickets for kids 2 and older, while Edwards makes you pay only for kids over the age of 3. Just by choosing Edwards over Pacific, we save an entire $10 on tickets (or $7 on a Sunday). And without any of the lying or fibbing about ages that we are so tempted to do, at that. Almost all big theaters have movie rewards cards. The benefits to each card vary. Some allow you to get reduced rates regularly, while others let you earn points to use towards tickets or concessions. 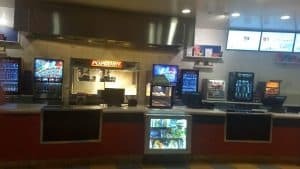 If you’ve ever tried to save money at the movies, you’ll know that concessions are where they get you. We are all suckers for the upsell (I mean, double the popcorn for 25 cents?? Yes please!). If there’s just two of you, or you know you’re limits, don’t bother with the upsell charges. That change can add up quick! But if you’re with your family, and are looking for a money saving movie hack? Go big, or go home. My kids LOVE those “Kid Packs” they sell at the theaters. And the price point is fairly low, so you won’t realize what you’re actually spending. If you have more than one child, however, those little meals will add up to big bucks (and not quite enough popcorn to leave them satisfied). If you’ve got three or more people in your party, we recommend going larger on concessions– as big as they’ll let you, really- and splitting. Not only is it more cost effective in the long run, but the theater will often allow you to refill a large popcorn to get twice as much. Our local Edwards even gives refills on large Icees! 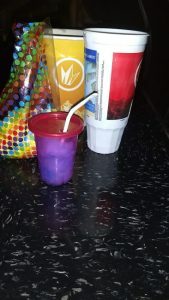 We often bring in our own bags to hold popcorn (and even empty take and toss cups to split drinks for the kids!). 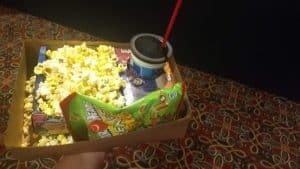 This way, everyone gets their own drink and bag without fighting over the containers, and you save money on movie concessions. Have you checked out the movie ticket selection at Costco? Most big theaters allow you to buy tickets at Costco or Sam’s Club for a reduced, flat rate for future use. When you’re ready to use them, you simply present them at the Theater Box Office and they’ll serve as payment for your ticket. You can save money at the movies by buying these tickets ahead of time– say, whenever there’s a little wiggle room in your grocery budget, or a few tickets a month- and using at your leisure. They also make fantastic gifts to give to a family, so keep this option in mind when the holidays come around! The old standard- sneaking in concessions. When I was younger, my grandmother used to pop popcorn at home and smuggle it in this giant carpet bag, along with a can of Diet Coke. 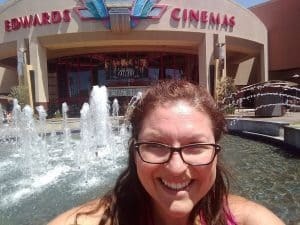 When it was time to take my own kids to the movies, I tried to do the same- with varying success. Many movie theaters now screen your bags before you enter the theater, making it harder to BYO candy in. 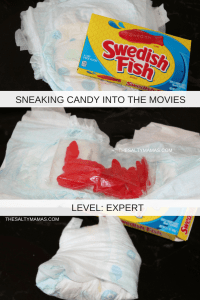 After our local theater changed their outside food policy from one week to the next, I found myself with some carefully selected candy in my purse and a couple of crying kids. Now, I’m not suggesting you break the rules here. But hypothetically, you may find that you can sneak in some elicit candy wrapped up in a (CLEAN!) diaper. Trust me- no movie theater employee is gonna want to open it up to see if it’s the real deal. With a little creativity (and let’s face it, a little bit of trickery), you’ll be able to make going to the movies more than a once-yearly treat for you family. How about you? Do you have any creative ways to save money at the movies? Tell us about them in the comments so we can add them to our bag of tricks! Looking for more money saving tricks? omg that diaper trick is NEXT LEVEL. I love it! I always bring candy and buy popcorn. I have a REALLY big purse and a very I-don’t-have-time-for-your-rules attitude, which has worked for me so far. I also bring the ‘movie theater packs’ from target so once I’m in the theater, we at least look the part. I’ve found the key to sneaking things in (or breaking small rules in general) is to be very, very distracted when it’s time for them to check your bag or ask you to do something. Be digging in you purse for something, talking excitedly to your big kid, or bouncing the baby and acting like she’s about to have a meltdown (even if she’s fine). If they ask you a question keep on being distracted and make it clear you’re not listening, following it up with a “Sorry…what? Hang on.” No movie theater employee wants to cause a scene just to look in your bag. Nobody wants to interrogate a frazzled mama! I like your style. Haha love the diaper trick! Also, making sure you buy the tickets at the theater instead of online will save you the convenience fee which can add up fast!